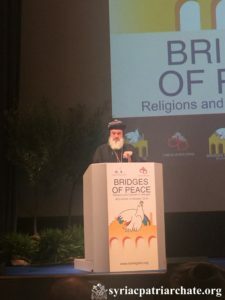 On October 14th 2018, His Holiness Patriarch Mor Ignatius Aphrem II participated in the Opening Assembly of the International Meeting for Peace “Bridges of Peace. Religions and Cultures in Dialogue” organized by the community of Sant’Egidio in Bologna – ITALY. During the opening, His Holiness had an intervention in which he considered that “the building of bridges of peace is not a choice for us to make, but rather a necessity to engage in for the sake of our future together and the safe future of our human race and our world.” He noted that we should build bridges of peace that strengthen the unity among all the people of God, stand strong against division and hatred, empower all against terrorism and fanaticism, accept diversity and encourage co-existence, connect East and West, and go beyond gender, race, or religion to reach the more sublime goal common to all, which is the wellbeing of all of God’s creation. “As good Christians”, His Holiness added “we are compelled to, not only embrace the culture of love and peace-building, but also to spread it around us. In fact, we are specifically called to be makers of peace, ‘Blessed are the makers of peace, for they shall be called the children of God’ (Matthew 5: 9)”. He noted the three aspects of peace: the peace within, peace with God, and peace with the other. He considered that “true peace starts from within our hearts”; however, he marked that “Inner peace is the result of a true Christian way of life […] (it) is the result of a total reconciliation with God and the fruit of a healthy relationship with Him”. “True peace” His Holiness added “is achieved when we go beyond the self and reach out to our fellow humans trying to bring them peace […] When there is peace to him who is far and to him who is near (cf. Isaiah 57: 19), then the whole world will be in peace”. His Holiness was accompanied by His Eminence Mor Dionysius John Kawak, Patriarchal Vicar in the Archdiocese of Eastern United States, and Very Rev. Raban Joseph Bali, Patriarchal Secretary and Media Office Director.